In a bold move, Carlsberg UK has declared it “probably” wasn’t the best beer in the world, but how vowed to rectify that. 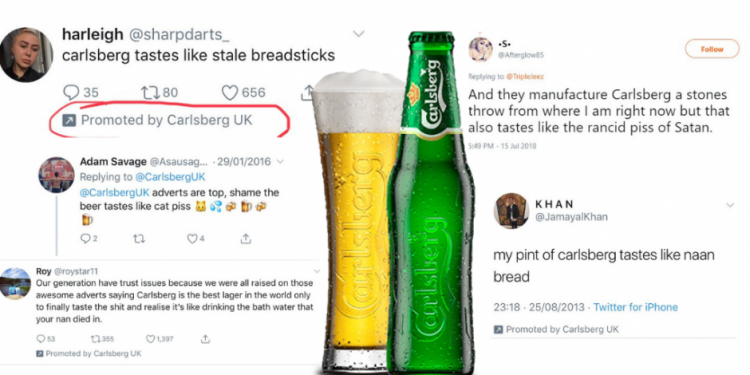 The UK brewer recently promoted tweets that mocked the taste of its beer, with two of the promoted tweets comparing Carlsberg lager to “piss” and a “corpse’s stale bathwater”. Social media users were quick to notice the odd activity, with some suggesting the brewer had been hacked. However, it has now been revealed the move was a bold play from Carslberg as it attempts to reposition itself as “premium” in the UK. The £20m ($AU36m) campaign will roll out across social media, out of home and digital. Created by agency partners Fold7, Clifford French and Initiative, the campaign was launched to highlight the upmarket Carlsberg Danish Pilsner beer. Carlsberg UK vice president marketing Liam Newton told The Drum Carlsberg UK had “lost” their way. Carslberg isn’t the only brand to launch a new campaign off the back of negative tweets. Last year in November, KFC promoted tweets that criticised its chips, right before unveiling a new recipe in a UK-wide ad campaign.